If you have diabetes, you and your doctor will likely discuss insulin—how to deliver, how often, and how long it will take to regulate blood sugar levels. 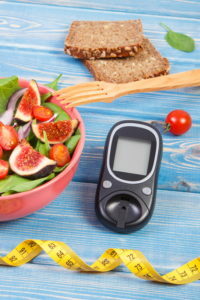 To keep blood sugar levels in check, insulin may be necessary. It can be delivered one of several ways: with a needle and syringe, with an insulin pen, or through an insulin pump. Insulin is a hormone produced by the beta cells found within groups called islets in the pancreas, an organ located deep in the abdomen. Insulin facilitates the uptake of glucose from the blood into cells so that the glucose can be used for energy. In type 1 diabetes, the beta cells stop producing insulin. In type 2 diabetes, the cells stop responding to the effect of insulin and the beta cells often cannot produce enough to overcome this resistance. Some people with type 2 diabetes require insulin and some do not, but all people with type 1 diabetes must have insulin treatment. Because enzymes in our GI tract break insulin down and render it ineffective, insulin must be injected into the fatty tissue under the skin in order to get it into the blood stream. Rapid-acting insulin: This insulin begins to take effect within 15 minutes of injection and achieves its peak effect one hour after injection. The effect typically lasts for two to four hours. Regular or short-acting insulin: This insulin begins to take effect within 30 minutes of injection and reaches peak effect between two and three hours. It typically works for three to six hours. Intermediate-acting insulin: This insulin takes effect within two to four hours, peaks within four to 12 hours, and lasts 12 to 18 hours. Long-acting insulin: This insulin beings to work three to four hours after injection and maintains a steady effect over 24 hours. Inhaled insulin: This is a newly available form of insulin whose time frame mimics that of rapid-acting insulin. It is usually inhaled just prior to a meal and is used in combination with long-acting insulin. Most people with diabetes who take insulin will be prescribed a combination of these different types of insulin. Your healthcare provider will help you determine this plan based on your typical blood glucose levels and your daily schedule. The insulin can be delivered one of several ways: with a needle and syringe, with an insulin pen, or through an insulin pump. 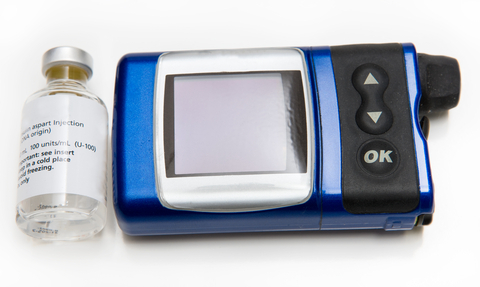 Insulin pumps deliver rapid or short acting insulin at several different programmed rates. There is a basal rate that delivers insulin continuously but which can be programmed to deliver different quantities at different times of the day depending on your typical daily schedule of eating, exercising, and sleeping. In addition, the pump can deliver a preprogrammed dose of insulin (or “bolus”) on demand if you anticipate a high carbohydrate or high glycemic index meal or if your blood glucose level is too high (the latter are often called correction boluses). Most pumps are connected by a tube to a catheter placed under the skin on your abdomen. Newer pumps work wirelessly and do not require a tube. A device called an artificial pancreas or closed-loop insulin delivery system, though not yet commercially available, is currently being studied. This device combines a continuous glucose monitoring system and an insulin pump with the goal of continuously monitoring blood glucose levels—and having the device automatically adjust insulin delivery accordingly. 2 diabetes, blood glucose level, blood glucose levels, blood sugar, blood sugar levels, diabetes, diabetics, gestational diabetes, glucose, glucose levels, Glycemic index, high glycemic, high glycemic index, hormone, insulin, Pancreas, people with diabetes, skin, sugar, sugar levels, type 1 diabetes, type 2 diabetes.